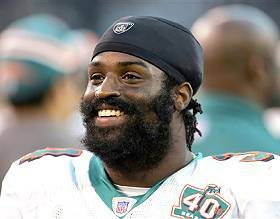 ricky williams will be suspended for the entire 2006 nfl football season. this is sad news for everyone, especially ricky williams fans. let me sum up ricky’s career without doing any research. coming out of university of texas, mike dikta (coach of the n.o. saints) traded all his picks away to get ricky williams 5th overall in the 1999 draft. he played three years for the saints. then the dolphins traded like a million picks to get him. it was totally worth it since he ran for like 1800 yards or something. he tested positive for marijuana use 3 times during his time in miami. he came out and admitted to smoking pot to help with the pain of carrying the ball nearly 400 times per season and to help with his social anxiety disorder. he faced a four-game suspension to begin the 2004 season, but he decided to retire instead. he liked football, but he was sick of the nfl. (who wouldn’t be?) so he spent the first part of the next year travelling the world. then he enrolled in a holistic medicine school in california. he also moved in with some guy that he met at radio shack. (i wish i would’ve been at radio shack that day. then we could’ve been roomates.) after the year, nick saban, the new coach of the miami dolphins, tried to get ricky to come back to football. he decided to do it. so he drove his old jeep cherokee from california to florida. he apologized to his teammates and his fans if they were upset at him, but he said that he didn’t regret his decision to take the year to do something other than football. everyone on the team said that he was a positive influence and a hard worker. coach saban loved him. anyways, a few months ago, ricky failed a 4th drug test. this one wasn’t for marijuana. he tested positive for an undisclosed substance. there seems to be hints that he was actually just using holistic medicines and that he tested positive because whatever combination he was using tested the same as an illegal substance. he appealed to the nfl, but they said no way. and now he’s suspended for an entire year. i seriously think it’s because his beard is so awesome. and because he quit football, so they’re trying to get him back. or something. or maybe it’s because when dikta drafted him he wore a wedding dress for a photo shoot. i don’t know much (anything) about football, and i don’t have a team or a favorite player. but i’m pretty sure i just got a favorite player based on that beard. it’s an entity in and of itself! too bad my favorite player just got suspended.